Contiq is an intelligent content discovery and customer engagement measurement platform designed for enterprise salespeople that recommends prior most successful content for engaging prospects and provides instant customer insights, to close deals faster. High performing prior slides, decks and PDFs are often the best starting points for tailoring content for customer presentations, and every professional, team, company has a treasure trove of slides and decks on their laptops and cloud drives. Ever wish yours were easily searchable? With Contiq’s AI based search, you can get recommendations on best content for selling into your accounts, instantly. Why jump between multiple instances of PowerPoint, Google Drives, SharePoints across local and cloud drives to find, view and copy & paste, decks and slides? With Contiq, you can stay where you already are—in Microsoft Office and everything connects and syncs - All your sync’d decks are mapped to your CRM opportunities and are available for search and reuse from anywhere. All done securely. What happens to a deck or PDF when you send it to a customer is often a mystery. 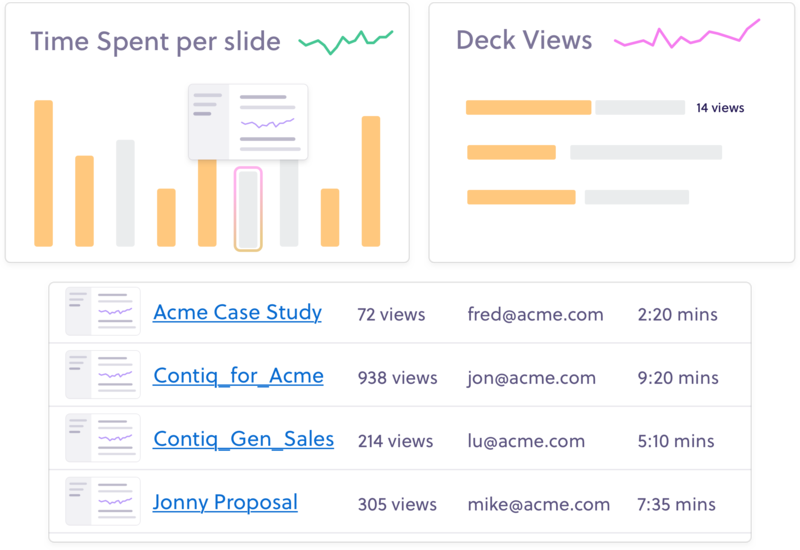 With Contiq, you’ll be able to know exactly when the customer opened the deck, how many times, dwell times per slide and more. This valuable customer engagement data can set the context to drive deals forward faster and provide valuable feedback to marketers on their account based marketing content. We are hosted on AWS who provides robust, physical data center security and environmental control. We don't mine or access your data for advertising purposes. We only use customer data to provide the service; we don’t look into your account without your permission. Your data 100% belongs to you. We won't delete data in your account without giving you time to export it. Check out our commonly asked getting started questions to get started.